Hello Every One today I am going to Introduce one more brand to my readers & friends , its Ecotique . 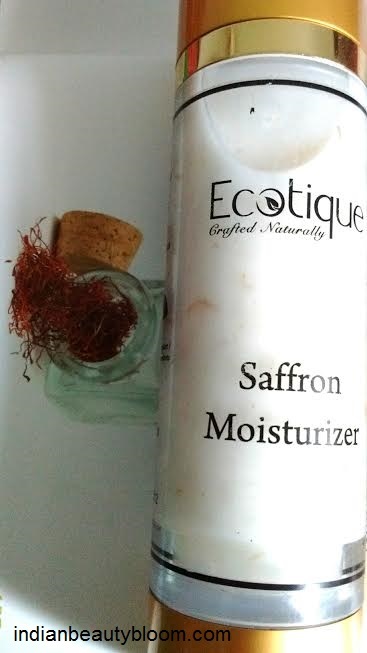 Ecotique is a Personal Care brand that combines Ayurveda & Aromatherapy to manufacture its products . Their products are Natural , free from Sulfates , Parabens , Silicones , artificial fragrance etc . They offer wide range of products like Moisturizers , Scrubs , face wash , Body Wash , Face packs , Massage oils etc . This saffron moisturizer is an excellent product with goodness of Cocoa butter , Shea butter , Saffron oil etc . There are few brand who really put effort to give an excellent packaging and Ecotique is one of them. I am totally impressed with its product packaging , it’s excellent . The moisturizer comes in a cute bottle which has a Golden Cap & when I opened that cap there was a pump using which moisturizer can be squeezed out easily. 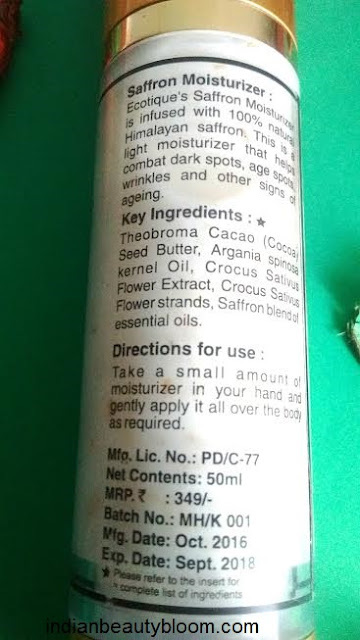 All product information is given at the back of the bottle . 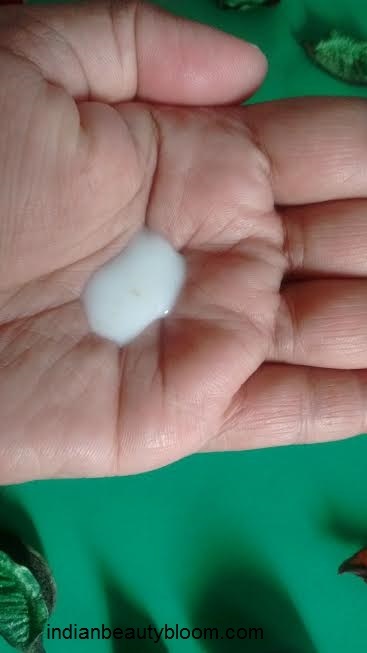 The moisturizer is of white color , it’s neither too thick nor has a runny consistency . One can even find small strands of Saffron in it . Has a heavenly Smell . Smell is strong & stays for a good period of time . 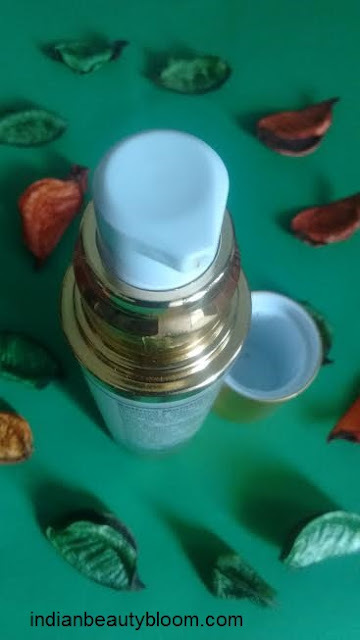 1.Contains all natural ingredients like Saffron oil , Shea butter , Cocoa Butter etc. 2.Does not contains any harmful chemicals . 3. Free of Sulfates , Parbens , Silicones , Glycol . 4. Free of artificial fragrance & Preservatives . 5. Excellent product packaging . 7. Nice fragrance which stays for long . 8. It’s a good moisturizer and keeps the skin moisturized for a long period of time . The product claims that it moisturizes the skin and helps to combat dark spots , age spots and other sign of ageing . It has good moisturizing Power , moisturizes the skin completely and keeps it hydrated for a long period of time . Staying period is as long as 10 -12 hours . 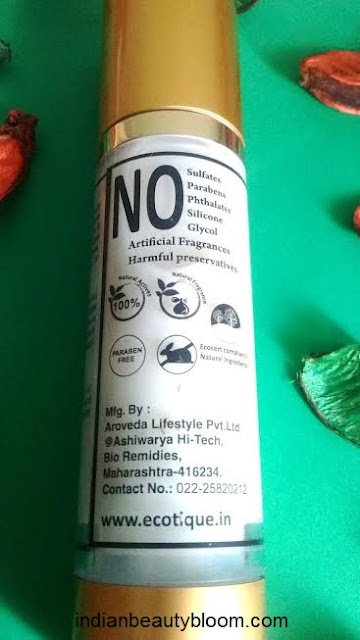 Since I have not used this product for a long period of time I can not say anything about it’s claim of dealing with signs of ageing problem but in general its an excellent product . One can buy Ecotique products from online stores like Amazon.in or Nykaa.com .